A great choice for a child who wears glasses (the featured hero is bespectacled). It's also a good way to discuss prejudice and stereotypes with children, and to encourage them to look beyond outward appearance. By day, Eliot Jones is a very quiet boy, who spends his days reading, feeding his goldfish and watching Mr Smith wash his car. But when the clock strikes midnight, Eliot is a superhero and flies about rescuing people and saving the day. Even the Queen requires his assistance to catch a royal jewel thief. One night, his most important mission to date turns out to be stopping a giant meteor crashing into the Earth. Eliot manages to stop the meteor in true James Bond style, by flying a supersonic jet and firing a Rocket Launcher. The Queen gives Eliot an award for his courage and ingenuity. 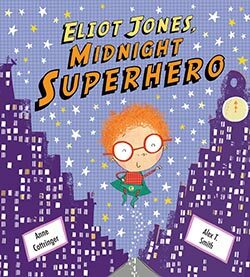 The final pages of the book describe how tiring it is being a Midnight Superhero…which explains why Eliot is so quiet in the daytime! This book's delightful mixed media illustrations have a comic book-like effect, which should appeal to children. We loved the central character with his curly red hair and oversized spectacles.